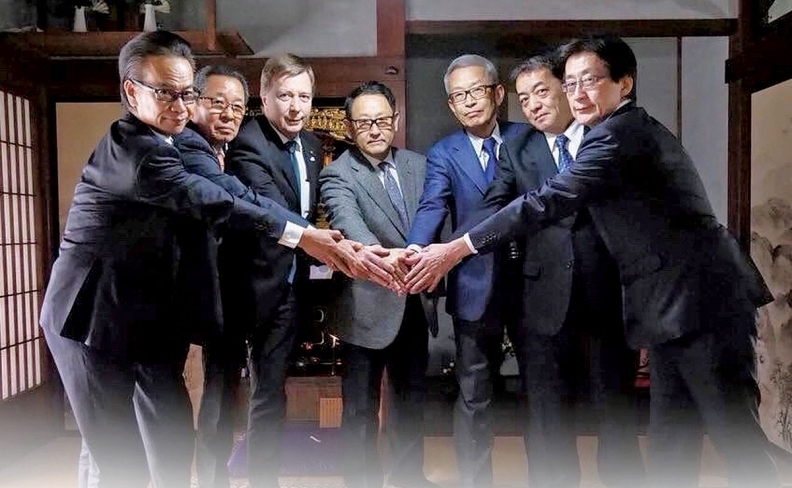 Toyota President Akio Toyoda has assembled a team called the “Seven Samurai” to lead the company's latest belt-tightening effort. From left, Shigeki Tomoyama, Mitsuru Kawai, Didier Leroy, Toyoda, Koji Kobayashi, Shigeki Terashi, Moritaka Yoshida. That’s the zealous new cost-cutting mantra coming straight from Akio Toyoda, as Toyota Motor prepares for a new round of belt tightening -- even as it books record profit. His U.S. market is already feeling the heat. The automaker reported last week that North America -- Toyota’s traditional cash cow -- booked a regional operating loss of 38.8 billion yen ($365.3 million) for the January-March period. That was down sharply from a loss of 70.7 billion yen ($665.6 million) the year before. But North American operating profit margin for the full fiscal year ending March 31 rang in at a meager 1.3 percent. Toyota wants to lift it to 8 percent by 2020, said Executive Vice President and CFO Koji Kobayashi. The maker of Camry and Corolla sedans has been slow to react to the U.S. customer stampede from cars to light trucks. North American wholesale volume declined 2.5 percent to 675,000 vehicles in the most recent quarter, and Toyota is locked in incentive competition with rivals. Chief Competitive Officer Didier Leroy and North America CEO Jim Lentz are working on a plan to shore up profits in the critical region. “We are trying very hard to re-establish earnings power in North America,” Kobayashi said. Part of the fix will be product, but part of it is cost cutting. To lead the effort, Toyoda has assembled a group of executives he calls the “Seven Samurai,” a nod to the famous Akira Kurosawa film about rogue warriors in feudal Japan. They are a new top management team hand-picked in January because they share his sense of crisis. The president’s admonition came even as the company reported record net income and record revenue globally for the fiscal year. But those results were buoyed largely by what he dismissed as artificial sweeteners -- favorable exchange rates and a one-off U.S. tax cut. Toyota won’t have either of those tailwinds going into the current fiscal year, as the yen strengthens against the dollar and other currencies, erasing windfall gains. And the stagnating global sales and lackluster profitability in North America cloud the outlook. Toyoda warned that the company needs to pump up the margins to afford the onslaught of investment it must channel into a host of next-generation technologies, in everything from autonomous driving and vehicle connectivity to electric cars and advanced batteries. Kobayashi said about 35 percent of Toyota’s $10 billion annual r&d budget is earmarked for next-generation technologies. The company’s target is to reduce costs by 130.0 billion yen ($1.22 billion) in the current fiscal year ending March 31, 2019. It will mean instilling a new mindset up and down the organization. Toyoda wants to deploy the famed Toyota Production System, with its kaizen mindset of continuous improvement, beyond assembly plants and bring it into administrative offices and r&d centers. Earlier cost-control campaigns didn’t cut deep enough, Toyoda said. A look at the just-ended fiscal year shows why. Without gains from aggressive cost reduction and foreign exchange rates, Toyota’s full-year operating profit would have declined. That means no more unnecessary meetings or superfluous paperwork. And no vehicle specification should be taken for granted; they all will be reviewed and optimized. Kobayashi, one of the Seven Samurai, said a streamlined new administrative process will guide how meetings are conducted at the automaker. “Just four lines of key talking points,” he promised. “In one hour, the decision is made and even that afternoon, things are implemented. In addition to Toyoda and Kobayashi, the other cost-cutting samurai are: Leroy; Shigeki Terashi, president of advanced r&d and engineering; Mitsuru Kawai, executive vice president in charge of factory supervision and chief officer for safety and health; Shigeki Tomoyama, chief officer in charge of Toyota Production System, business development and information systems; and Moritaka Yoshida, chief officer for midsize vehicles and the Toyota New Global Architecture, the company’s redesigned modular vehicle platform.